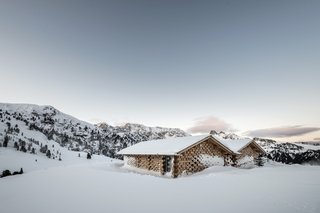 Celebrated for its outstanding mountain views and warm Italian hospitality, Zallinger Alpine Retreat’s charms have been recently elevated with an eco-friendly renovation and expansion by noa* network of architecture. 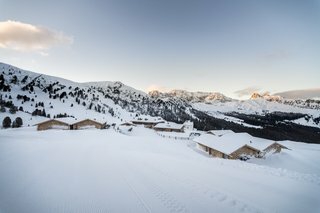 Zallinger is located on the ski slopes of the Alpe di Siusi mountain range, and it opens up its restaurant and lounge to visiting skiers. 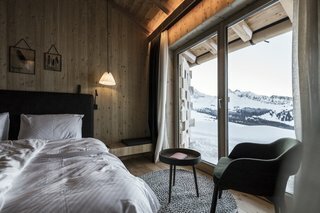 Bearing the region’s seal for sustainable lodgings, the newly certified ClimaHotel boutique getaway has added 24 rooms (to the original 13 rooms) in seven new mini-chalets—a reincarnation of the seven timber barns that once occupied the site. 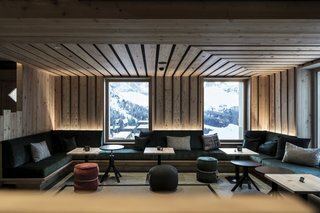 Remotely tucked away in an alpine meadow in South Tyrol, Zallinger was once a historic Alpine village that has been reincarnated as a boutique hotel. "We discovered historic photographs from as early 1850 that revealed the evolution of the Zallinger during the last decades," architect & noa* network of architecture partner Andreas Profanter explains. 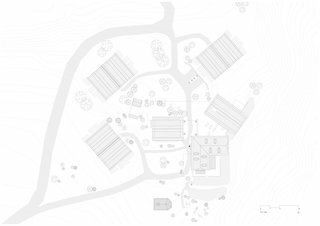 "Our research demonstrated impressively that an alpine village, consisting of different buildings for housing and farming, already existed in this area, but was later demolished. In that context, our design can be perceived as a return to the roots of this place, by both simultaneously looking back and forward in time." The shingled wood roofs were inspired by South Tyrollean architecture. 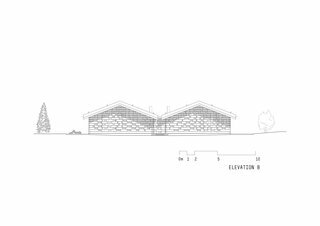 The architects’ sensitive approach to site history carries over to construction as well. 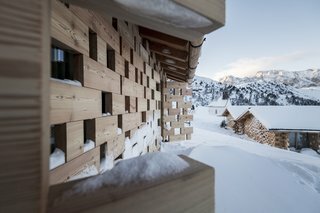 To minimize landscape impact, the firm prefabricated the seven chalets off-site using certified materials, including locally sourced larch. 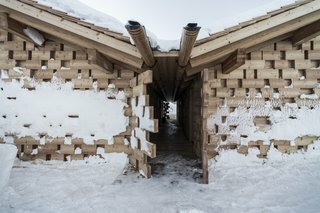 The paths between the chalet are deliberately unlit at night to avoid light pollution. Instead, guests are given lanterns. A pallet boiler powers heating and hot water in winter. It's stored in a buried silo in the summer. 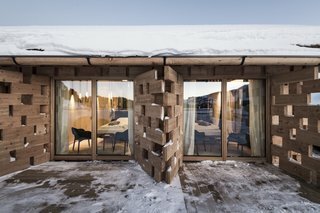 The four-room chalets are arranged in pairs and set on concrete bases. 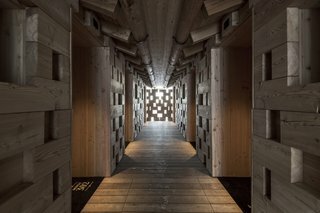 Each building's eye-catching facade is comprised of staggered solid wood blocks, evoking a modern log cabin that pays tribute to the traditional timber architecture in South Tyrol. 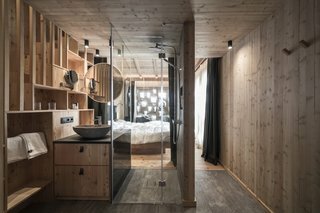 The four rooms in each chalet are not connected, but they can be accessed via a shared hallway to ensure privacy. 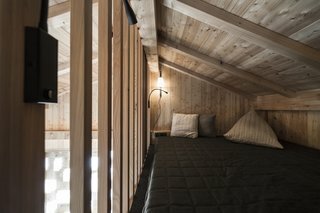 "The walls are covered in wood, with the idea to recreate the atmosphere of a traditional "stube"—the classic alpine room where once the family gathered around the fireplace—but with the contemporary sign of the wooden boards that seamlessly rise from the walls and on to the ceiling, behind which, sound-absorbing panels have been positioned to create maximum acoustic comfort," the architects add. Set the stage for an effortlessly cool bedroom. 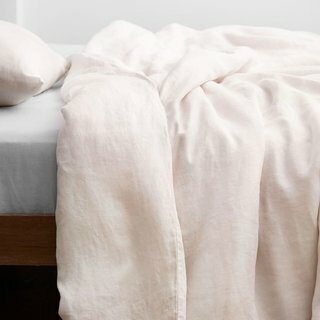 Breathable yet warm, this duvet is the perfect layer from summer to winter. Garment-dyed and stonewashed to give you an airy, soft, most perfectly worn feel ever (no, really). 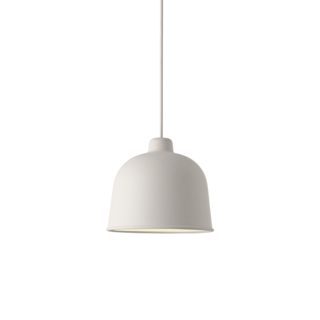 A textural fusion of recyclable materials, the Muuto Grain Pendant is a lightweight shade composed of bamboo fibers and polypropylene, ideally formed for comforting down light. 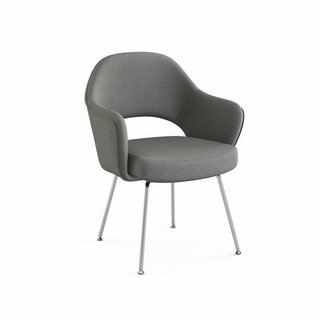 Featured in nearly all Florence Knoll-designed interiors, the Saarinen Executive Chair has remained one of our most popular designs for nearly 70 years. The cozy, larch-lined interiors are dressed with knitted materials and open up to the spectacular outdoors through large windows. The interiors were mostly designed by noa* network of architecture and constructed by local firm Tischlerei Rier. Some rooms have a small loft that can be used as a bedroom for children. The main building of the hotel, which dates back over 160 years, received a sensitive renovation—including the reception, lobby, lounge, and restaurant. 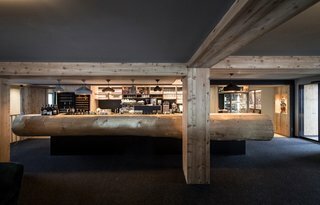 A gigantic fir tree trunk serves as the bar counter, providing a connection to the outdoors. The bar lights are by Spanish company Marset. 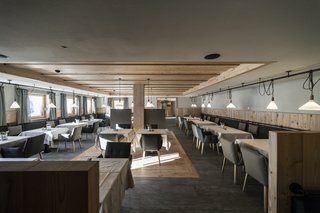 A look inside the restaurant, which is open to outside guests. 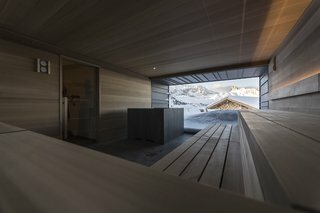 The architects also added a new wellness area housing a lounge and sauna with two stunning vantage points: One faces the valley, while the second looks out onto Mount Sassopiatto. A peek inside the sauna. "Sustainability, respect for the mountains, and direct contact with nature are the principles that have guided all design choices," the firm says. 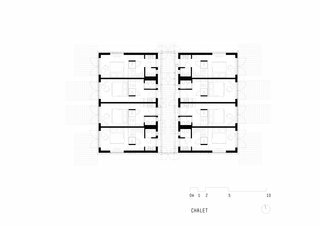 "For example, in the design of the new rooms, careful use of the space was made to provide high levels of comfort in relatively small sizes." The Zallinger has been certified under ClimaHotel, a program under the Climate House Agency of the Province of Bolzano. All built-in furnishings were designed by the architects. The height-adjustable tables are from Billiani. 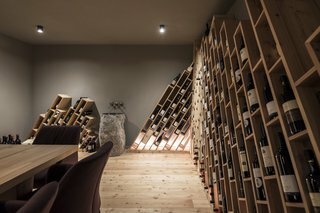 The new wine cellar references jagged mountain peaks with its geometric wooden shelving. For booking enquiries, head to the Zallinger’s website.